Ludwigs thrive on light, iron, and fairly rich soils. Cuttings are taken by lopping off a stalk under the adventitious roots. 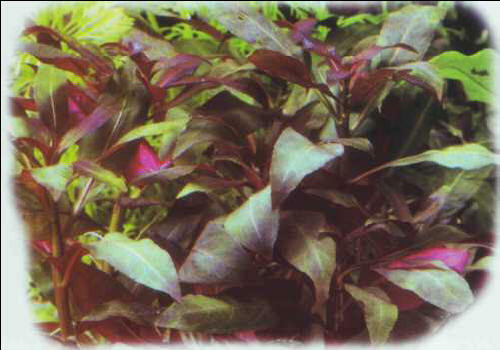 Another option is to cut off the top of the plant, which avoids the loss of any of the lower leaves. Size: 30 cm. The totally aquatic large-petaled ludwig can sometimes appear above the surface. It tolerates a wide range of hardness and a pH of around 7. It is especially recommended for beginners. As its name indicates, the leaves of the alternate leaf ludwig are arranged alternately along the stem, and not directly opposite each other. It prefers soft, acid water. Size: 30 cm. 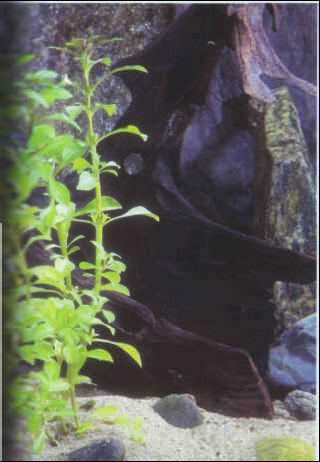 A fairly resistant plant, the false lusimakhos tolerates hard, alkaline water and temperatures slightly below 20°C. It can therefore be used in a temperate aquarium. Size: 30 cm. The rampant ludwig is found in both a green variety and a reddish variety. Both require good lighting but are considered hardy. Size: 30 cm.